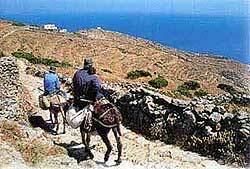 Those who visit Folegandros, are those who want a taste of genuine island life rather than a nonstop party. Folegandros is one of the most alluring Greek islands. Those who visit Folegandros, are those who want a taste of genuine island life rather than a nonstop party, and the locals having seen what happened to Ios, are determined to keep it this way. Admitelttedly, Folegandros gets crowded during July and August, but come any other time and it's a blissful place. The island has several good beaches and a striking landscape of cutlivated terraces giving way to precipitous cliffs. 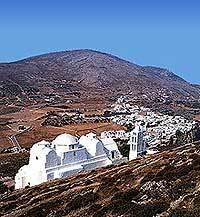 The Hora or Folegandros, which consists of two settlements, is situated above the harbour at Karavostassis. In the old part of the town, in the area of the kastro, the outside walls of the houses form a fortifying wall (as is the case on many cycladic islands). 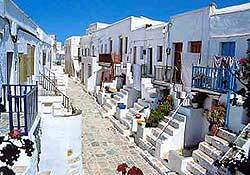 The more recent settlement is equally attractive, with its narrow little alleyways, low stone walls, courtyards, wooden balconies and Aegean-style churches. The finest church on the island, that of the Panagia, was built on part of the wall of the ancient town. Slightly further lies Chryssospilia, which has some magnificent stalactites, stalagmites and relics from antiquity, and the area of Ano Meria, comprising a number of small hamlets, where the colourful feast of Agios Panteleimon is celebrated on 27th July. There is an Ecology and Folk Museum in Ano Meria which contains exhibits and scenes reconstructed from the traditinal peasant way of life on the island. Vathi - Is a large bay west of Folegandros. It is recommended to anchor there in calm weather . A bay for a swim or lunch. There is a pebble beach at Karavostassi, and also at Livadi Beach, the next bay around. The island's finest beach is sandy Angali, where there are several taverns. Other good beaches are Agios Nikolaos and Livadaki, both north-west of Angali, and Agios Georgios, which is north-west of Ano Meria. A path from Ano Meria's Church of Agios Andreas leads to Agios Georgios beach. There are several cafes and restaurants with a spectacular view.